1) Please share this newletter alert with your own networks in your county and sphere of influence. 2) It would be great if you would add a personal testimony/experience you have had working with OK-SAFE and why this effort is important to your own efforts in your own county. 3) Please send us a copy of your letter and/or testimony so we can share it online to help promote the moneybomb and your efforts as well. Thanks always for all you do and for all the lives you have changed because of your faithfulness! 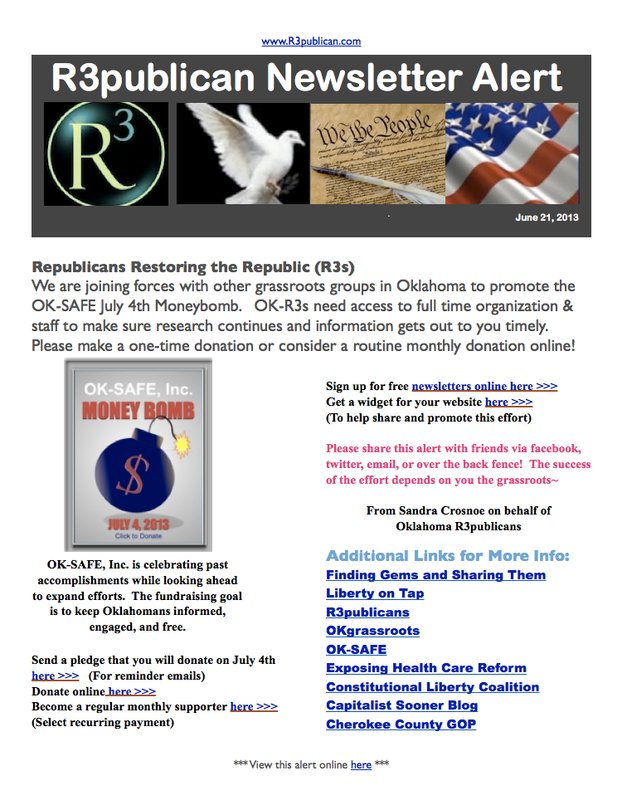 We are joining forces with other grassroots groups in Oklahoma to promote the OK-SAFE July 4th Moneybomb. OK-R3s need access to full time organization & staff to make sure research continues and information gets to you timely. Please make a one-time donation or consider a routine monthly donation online! OK-SAFE, Inc. is celebrating past accomplishments while looking ahead to expand efforts. The fundraising goal is to keep Oklahomans informed, engaged, and free.